Today’s post is about a motivational quote that is often falsely attributed to Theodore Roosevelt. It is very popular across the internet and in quote books. Here is the quote found in chapter IX of Theodore Roosevelt: An Autobiography (first published in 1913). 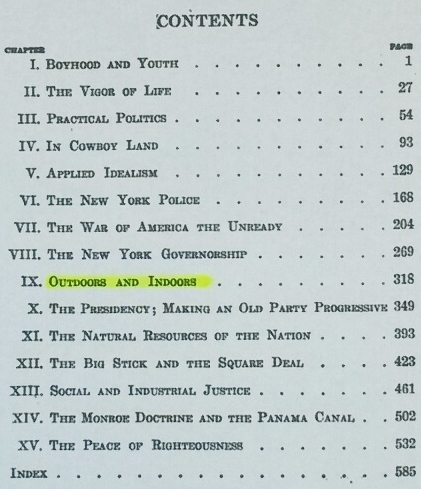 Note that Roosevelt clearly attributes the quote to Squire Bill Widener. The quote virus is having a field day with this quote. After surveying 135 infected websites, I found the following statistics. Please keep in mind, this is an incomplete sample; there are many more sites featuring this misquote. I stopped at 135 because I think that is an adequate amount to get a good approximation of the statistics. Once again the majority of websites featuring the misquote are websites with an emphasis on providing an extensive quotes collection. And once again, I will reiterate that quote websites are not reliable sources for quotes. Use a source that includes detailed information for each quote. In addition to the author/orator’s name, there should be accompanying data that enables you to find and verify the quote easily. This data can include book title, chapter, play title, act, scene, poem title, line number, or speech date and location. Somehow over the years, the words “with what you’ve got” have morphed into “with what you have,” and this is the most popular version of the misquote. The second most popular version has the words “where you are” transposed into the middle of the sentence instead of at the end. The least popular version of this misquote is the one with the correct wording. That figures! Some people don’t mind paraphrased or reworded quotes. I am not one of them. It doesn’t make sense to reword quotes by orators or writers who are revered for their skills in speaking and writing. I have seen reworded quotes from William Shakespeare, Harriet Beecher Stowe, Walt Whitman and many other great authors which I think is downright sacrilegious. It doesn’t make sense to alter words written by the greats. After all, this is why they are being quoted—their brilliance in the craft of words. I know there are people who disagree with me, but that is my humble opinion and I’m sticking to it. There are probably a couple of factors contributing to the birth of this misquote. The first is the obvious being that Theodore Roosevelt did indeed utter and write these words. Unfortunately, even though he gives full credit to Squire Bill Widener, this information does not get forwarded with the quote. I am guessing this is because a quote has more of an impact if it is from a well-known person, and sadly, Mr. Widener does not fit into this category. Another contributing factor to this misquote is probably due to quote hunters not taking the time to read the full text in which the quote appears. They instead presume that all the words contained within a book are originated by the author. As some of my previous posts have demonstrated, this practice results in misquotes. For example, my 10/21/14 post titled “Who wrote it? Wordsworth or Michelangelo?” illustrates how William Wordsworth gets misquoted because he translated into English words written in the Italian of Michelangelo. 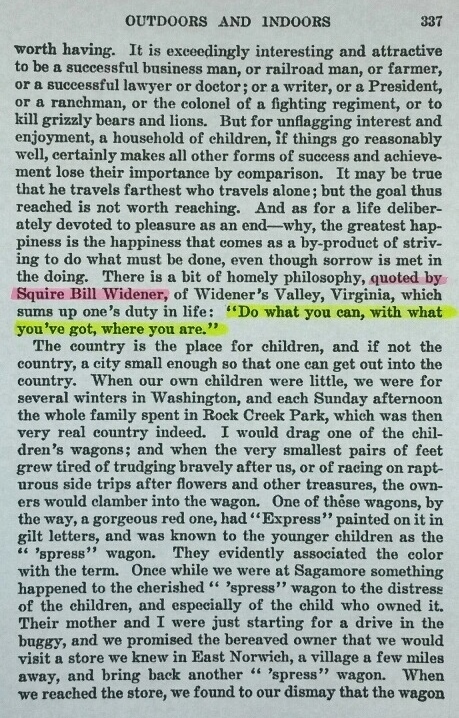 Another example can be found in my 08/12/14 post titled “Another Erroneous Inspirational Quote—Another Method of Origin.” In this instance, Mark Twain gets misquoted because he includes Samuel Watson Royston’s entire short story within his own book The £1,000,000 Bank-Note and Other New Stories. 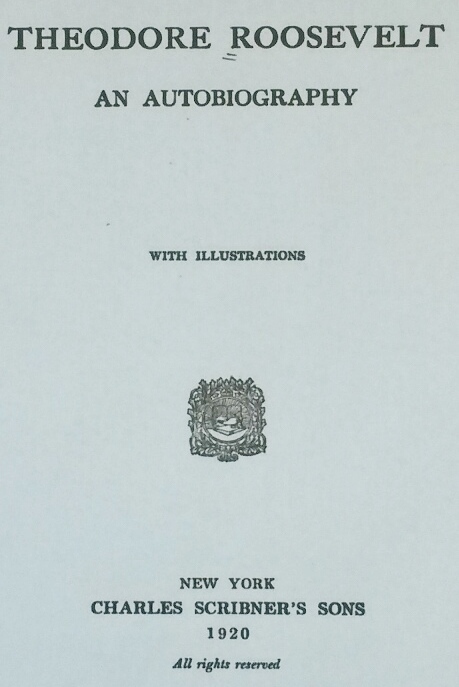 In both cases, a disclaimer is included to clarify that the author did not write the included work, and recognition is given to the proper originator. Unfortunately, these efforts to give credit where credit is due are overridden by individuals who do not take the time to read the quote in its full context and thereby create a misquote that gets propagated like a virus throughout the literary world. On the positive side, there are a handful of websites that not only provide the quote with the correct wording but also provide the correct attribution. Many of them also point out that this quote is often misattributed to Theodore Roosevelt. So there is hope! I came across five books containing the misquote. They range in publication date from 1993 to 2013. One of these books is dedicated solely to quotes. I noticed that most books prior to the inception of the internet have the quote correctly worded and attributed. I’m going to sound like a broken record again, but quotes found in books published after the birth of the internet are particularly unreliable as most of these authors use the internet as the source for their quotes. This does not mean that all quotes found in books prior to the internet are accurate. It just means to be wary of contemporary books. And this includes quote books. As with most of my previous posts, today’s misquote is available for purchase. In fact, it is the most popular for-sale misquote I have researched to date. For as little as $7.00, you can have your own framed print. You can also have a framed, “autographed” print for $49.99; the so-called “autograph” is an image of Roosevelt’s signature superimposed onto an image of the misquote. A variety of t-shirts and coffee mugs are also available for purchase. Unfortunately, these products are another method of misquote propagation. I will once again conclude with a plea to help kill the quote virus. Never trust a quote website. Do not trust a quote book unless it provides detailed source information. And if you’re hunting for quotes, make sure you read the entire text in which the quote is found. As today’s misquote illustrates, all content in a book is not necessarily written by the author. Please visit my “What You Can Do” page for a complete list of pitfalls to avoid. Very we’ll written and extremely informative. I agree, the paraphrasing or rewording of a quote is sacrilegious and over a long period, these quotes could be altered several times, to the point that they are completely altered and unrecognizable. Excellent post, great research. I found a similar quote attributed to Arthur Ashe. Do you know something about this quote? Now, I’m suspecting that it could be another misquote. The Arthur Ashe quote is found seven times in his book Arthur Ashe on Tennis: Strokes, Strategy, Traditions, Players, Psychology, and Wisdom. I have not read the book, so I don’t know if he quoted someone else or if these are his own words, but they do come up in a Google book scan. I have received other comments about this quote so if you happen to read the book, please let us know if they’re his words or not. Thanks for the question and the thumbs up. I really appreciate it! Today I saw a video on Facebook from a known friend- video was shared. according to the Facebook stats, it had been viewed over 53 million times!- nice video, but also mis-attributes this quote to T. Roosevelt… I made a comment about it,- should be Squire Bill Widener, as you say… Google books helped me see the way, so good for them…. a faithful academic, best,..MD. Wow! Fifty three million times is A LOT! Hopefully, the same number of people read your comment. Thanks for sharing these stats.